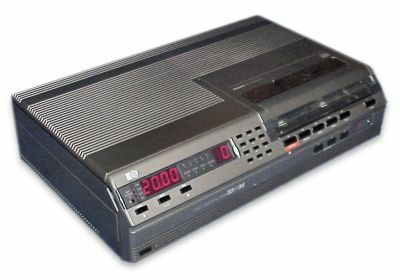 The V2324 was a second generation machine from Philips. Styled in a similar fashion to the V2020 family. The biggest difference is in overall size, it occupies less than half the volume of the V2020, and weighs considerably less. The electronic tuner could store upto 99 channels in its electronic memory and the timer could be programmed to record upto 5 events. The built in clock could be set for any date up to the year 2099 making it Millenium Compliant. The machine was produced in a dark grey colour and was retailed in the UK for £ 399 in 1983. Many thanks to Kelvin at AudioViz for help with information on this model and to Ian Barlow for the picture.